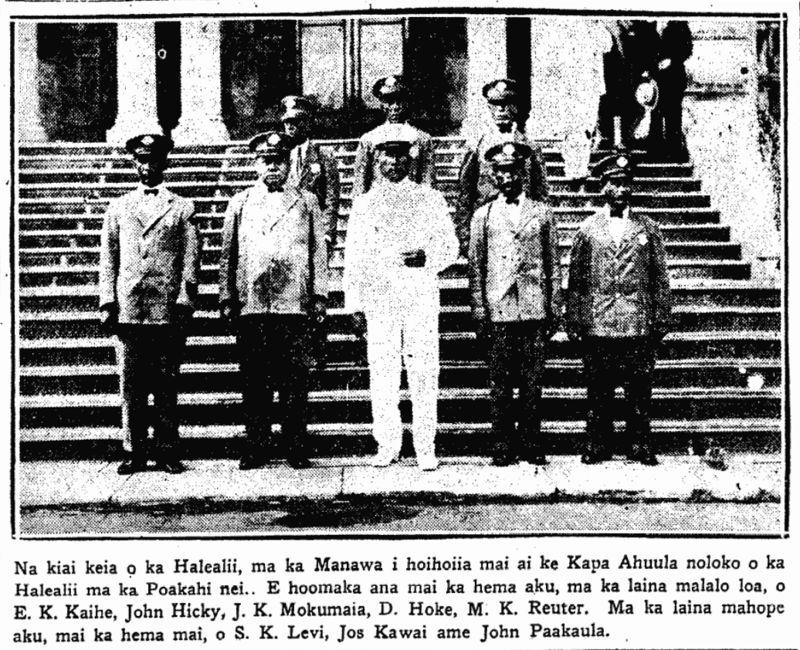 Another image of the return of Kamehameha III’s ahuula, 1927. The guards of the Palace, when the Ahuula was returned to the Palace on this past Monday. Starting from the left, on the bottom row: E. K. Kaihe, John Hicky [John Hickey], J. K. Mokumaia, D. Hoke, and M. K. Reuter. The row in the back, from the left: S. K. Levi, Joseph Kawai, and John Paakaula. Ka Nupepa Kuokoa, Buke LXVI, Helu 53, Aoao 4. Dekemaba 1, 1927. This entry was posted in Alii, Clothing and tagged ahuula, D. Hoke, E. K. Kaihe, feather cape, J. K. Mokumaia, James Lawrence Kearney, John Hickey, John Hicky, John Kulia Mokumaia, John Kuliaikekauaakamehameha Mokumaia, John Paakaula, Joseph Kawai, Kamehameha III, Kauikeaouli, M. K. Reuter, S. K. Levi by nupepa. Bookmark the permalink.